Pleiades is more than just a set of new houses in Downtown Durham – it's a neighborhood, and any great neighborhood shares some common features. When we designed Pleiades, we envisioned a central green space as a place for neighbors to gather, stretch out and relax. We committed ourselves to incorporating common-sense energy efficient building and design principles. And, we aimed to create modernist, light-filled, comfortable homes that were easily walk-able and bike-able to many of Durham's treasures. We named this pocket neighborhood of nine homes Pleiades (PLEE-uh-deez) after the luminous cluster of nine stars in the constellation Taurus to highlight it as a new, shining addition to our beloved "Bull City's" evolving fabric. This is Pleiades Modern. Premium features designed in every home. Private, fenced back and side yards with access to a central common green space. 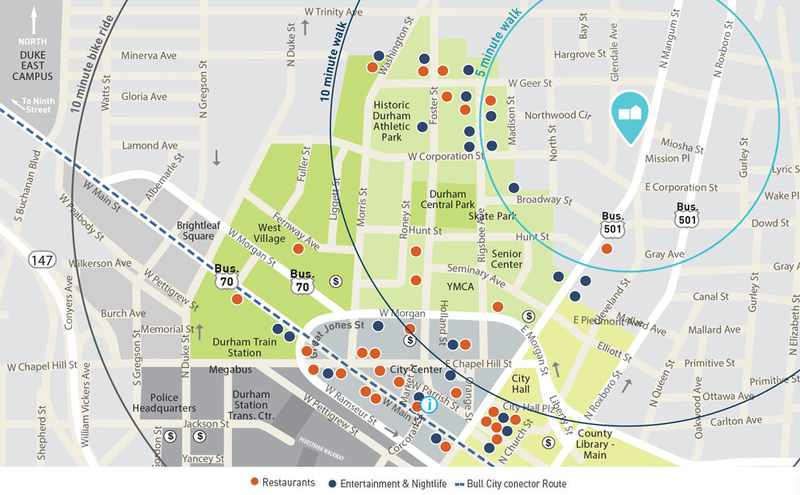 Walkable to Durham’s Central Park District, City Center, American Tobacco and more. Built to ENERGY STAR standards. Prewired for solar power with option for discounted installation. Through the extensive use of glass and great design we've created living spaces that connect residents with the sun's light during the day and with the city at night in a way that simultaneously energizes and refreshes. Skylights illuminate stairwells and flood interior spaces with light. Large sliding glass doors bring the outside in. Open floor plans add to a sense of volume and light. Stretch. Pause. Take a deep breath. This is your space. Pleiades kitchens are the heart of your home. Modern chrome fixtures, custom cabinetry, tile back-splashes, stainless steel appliances, and quartz or granite counters make cooking and dining a treat. Spacious center islands with mitered waterfall counters offer both a casual place to dine and an impressive place to entertain. Private decks and courtyards may host your outdoor kitchen and extend mealtime outdoors. Equally important to the draw of downtown is the ability to retreat into your own private spaces to entertain friends or connect with neighbors. Each home comes with its own private, fenced in yard and some even come with a private second floor terrace. Want to spread out? Meet your neighbors? Kick a ball with the kids? A central green space provides the opportunity for this pocket neighborhood to have its very own private park, fire pit and/or community garden. Common sense energy efficiency applied here. Save on gas and mileage by walking or biking around downtown. Reduce your energy bills by living in a home built to ENERGY STAR standards. Natural light, spray foam insulation, sealed crawl space, dual zone HVAC, and tankless water heaters are standard. Want to take advantage of that Carolina blue sky? These homes are pre-wired for solar panels with option for discounted installation with Yes Solar Solutions. Pleiades is simply part of the larger whole that is Downtown Durham. Living here, you would be within a short walk or bike ride to some of the best restaurants, breweries, coffee shops, parks and entertainment that Durham has to offer. Here are a just a few of our favorite local haunts that are sure to become some of yours. Shop the Durham Farmers Market year round for local produce, sample tasty and eclectic nosh at a food truck rodeo, play with the kids at the interactive Mount Merrill, or explore the multiple gardens of this unique, 5 acre green space that is Durham Central Park. Featured in Travel & Leisure, Garden & Gun, Southern Loving, The Local Palate, Saveur and more, SALTBOX Seafood Joint, is a small chef crafted seafood stand located in the historic Little Five Points neighborhood. Inspired by the classic American fish camps and waterside seafood shacks, the SALTBOX cooks up seasonal, sustainable, fresh seafood that is delivered fresh from the Carolina coast. Open most days "until the fish is sold out," you'll be willing to stand in line to enjoy the daily catch before its gone! Motorco Music Hall is an entertainment and events space including a Showroom, the Garage Bar, and Parts & Labor restaurant. Catch a music, comedy, dance or film performance, or just hang out with friends, family and your furry best friend (dog) on the large outdoor patio. Enjoy a wide selection of local beers, cocktails and eats inspired by global street food. Owners Leon and Areli Barrera de Grodski believe "coffee, chocolate and tea are age old lubricants for ideas." This is serious, craft coffee and beverages. Signature drinks such as the "Dr. Durham" include exotic ingredients such as homemade vanilla, maca root powder and black lava salt. But make no mistake, Cocoa Cinnamon is as approachable as Durham - its cozy interior and spacious outdoor patio offer a delightful space to savor a beverage, share ideas, read a book, or take a much needed respite from the day. CrossFit Durham is not your typical gym. With rules like "Check your ego at the door," "be an active part of our community" and "don't worry about how you look," this is a gym focused on hard work, healthy lifestyles, and real solutions. Coaches emphasize proper mechanics and consistency, before applying the intensity for which CrossFit is known. All fitness levels are welcome here and will experience a challenging, functional and fun workout every session. "We seek no less than to build a Southern Beer Economy…one pint at a time." Fullsteam is a Durham, North Carolina production brewery and tavern inspired by the food and farm traditions of the South. Their mission: to pioneer the art of Distinctly Southern Beer. Visit this large, indoor / outdoor tavern space to enjoy a casual, family-friendly and dog-friendly space while drinking Fullsteam's locally sourced and seasonally inspired beers. A rotating selection of food trucks provides tasty sustenance to complement the beers. Born in Durham, and now expanding rapidly due to popular demand, Rise Biscuits Donuts delivers on its motto of "serving the best dang donuts and biscuits." Old school, new school, and specialty donuts with interesting and unusual flavors, biscuits featuring everyday favorite fillings like country ham, bacon, sausage, fried chicken, and fried eggplant “bacon,” as well as a variety of cheeses, spreads, and eggs, combined with the ability to enjoy it all sitting in Durham Central Park will have you coming back for more. Located in the former Fletcher's Gulf Station on the corner of Foster and Geer St, Geer St. Garden treats guests to wholesome and delicious food in a modern beer garden setting. Enjoy pasture raised burgers, grilled fish tacos or a grilled pimento cheese alongside a cool, local draft beer. Or while away a Sunday with a scrumptious southern-inspired brunch and a cup of locally roasted coffee or a Bloody Mary with your favorite fixings. Living it up in downtown Durham. At Pleiades, we are fully engaged in the art of place making. That's why we carefully selected our location and spent countless hours on the details of the residences, the yards and the pocket park. We hope to enhance an already vibrant neighborhood and for Pleiades to quickly become known as one of Durham's most convenient, enjoyable, and livable communities.